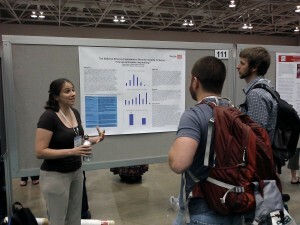 SSI Travel Grantee Casey Taylor writes about her experience at the Ecological Society of America’s Annual Meeting in Minneapolis, Minnesota in August of 2013. Casey Taylor is a student at OSU who received $500 in funding from the SSI Fee Board in order to attend the Ecological Society of America’s Annual Meeting in Minneapolis, Minnesota. Casey wrote up a blog for the Ecologue to describe the trip and benefits that she got from attending the meeting. It is commonly argued within the ecological community that ecologists should become more involved with the public and with public policy concerning environmental sustainability. Many ecologists complain, though, that getting involved publicly is often considered to be an “extra”—something nice to do if you have the time after all your other responsibilities, or worse, something that may negatively affect your credibility among other scientists. That being said, how do ecologists engage in the public sphere when given an institutional motivation for doing so? Last summer, I traveled to the Ecological Society of America’s annual meeting in Minneapolis, Minnesota to share the initial results of a research project aimed at this question, and to see how the organization’s members would respond. I wanted to study these questions because, as a community, ecologists are well aware of the connection between their field of study and the wider environmental problems that face society, and often advocate for greater public involvement. However, my previous experience conducting ecological research during my confirmed the prevalence of the concerns mentioned above among ecologists about such public involvement. Recently, the National Science Foundation has begun requiring attention to the broader impacts of proposed research projects, the NSF hopes to encourage a greater connection between the world of scientific research and the society that sponsors it, and has the potential to address these concerns among ecologists and other scientists. I wondered if ecologists, as a subset of scientists that acknowledges its closeness to the environmental issues faced by society, would take up this requirement as an opportunity to carry out more public engagement activities considered within the academic establishment as a distracting and potentially damaging extracurricular activity. My research in this area is still in its early phase, but a few patterns have emerged. What I have found so far is that ecologists do engage in public engagement projects more than the other groups that have been studied in response to the NSF’s broader impacts requirement, but that they preferred to stick the familiar terrain of training graduate students and building academic collaborations (two other suggested ways of meeting the NSF requirement) rather than engaging with the broader community. When the time came for my session, lots of conference attendants stopped by my poster to talk about these topics. Many were enthusiastic about the importance of fostering better connections between ecologists and public audiences. Some emphasized the frustration they felt toward the resistance within the scientific community toward public engagement activities, while others were optimistic about the changes they felt the broader impacts requirement was beginning to affect in academic culture. Certainly, there appears to be a solid core of ecologists who welcome the changes brought by the NSF, and the greater legitimacy it offers to get involved in the public realm and bridge the divide between the scientific community and broader society. After the ESA meeting, I had the opportunity to meet with an organization of ecologists called the New World Agriculture and Ecology Group (NWAEG). The members of this group are dedicated to bridging their academic work with issues of conservation, social justice, and sustainability. This group, which also includes my mentors from my Master’s program at the University of Michigan, is inspiring for the way its members and their colleagues persistently strive to connect their research to the most troublesome problems faced in efforts to create a more sustainable and just global society. For my part, I found myself able to participate in their discussions from a whole new angle based on my time in OSU’s Public Policy program. Now that I am back in Corvallis, the experiences that I had this summer attending the ESA and NWAEG meetings in Minneapolis will be incredibly helpful not only in continuing with my work studying public engagement by ecologists, but in helping me to chart my own future as an academic dedicated to maintaining an active connection to the community surrounding me.